Although your feet contain fully a quarter of the bones in your body—52, to be exact—they are typically sorted into just 3 main groups. 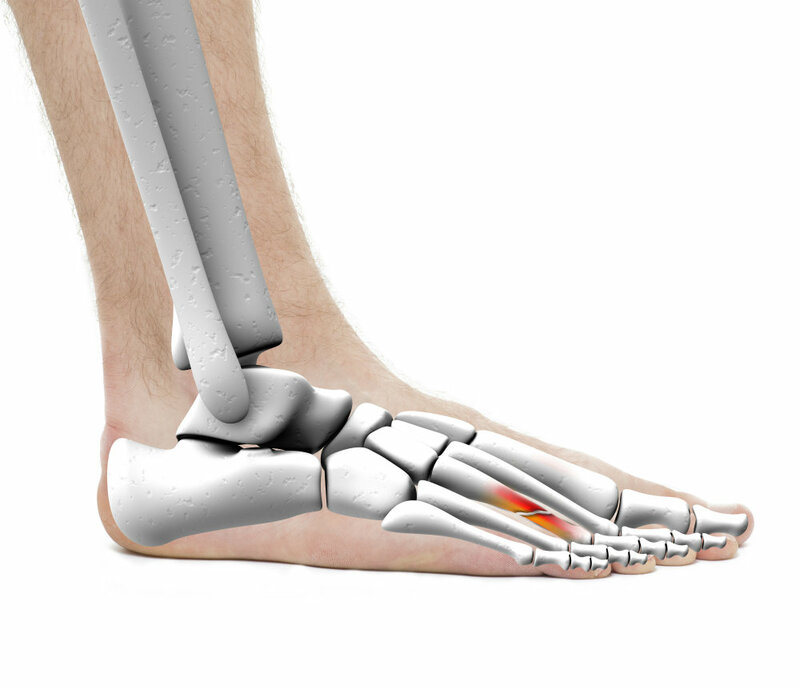 The phalanges make up your toes, while the tarsals cluster around your heel bone at the back of the foot. In the middle sit five long bones on each foot: the metatarsals. The metatarsals arc upward, giving the foot arch its distinctive shape and helping to support and cushion the impact of gravity on your body. They are also, typically, the foot bones most likely to fracture from either an acute injury (such as a single, violent impact) or crack under repetitive strain and stress. The fifth metatarsal, which is along the edge of the foot on the later (pinky toe) side, is especially susceptible to injury. There’s a common myth, perpetuated frequently, that nothing medically can be done about metatarsal fractures. This couldn’t be further from the truth! Although rest will likely be an important component of treatment, it is extremely important to have a professional evaluate your condition whenever you suspect an injury or broken bone in the middle of your foot. When bones don’t line up or injuries don’t heal correctly, pain lingers and long-term complications can form. Depending on the location and severity of the break, our experienced sports injury team may prescribe remedies such as splinting, taping, or providing rigid-soled shoes for protection. In more serious cases, immobilization via casting, regenerative medicine, or even surgery might be the preferred treatment course. It is important to determine, as quickly as possible, which procedures will offer you the best results when considering what your body needs, and what your personal goals are. Before your appointment, protect your foot by keeping the weight off and avoiding strenuous activity. This will help you avoid making the injury worse in the meantime, and allow healing to begin as soon as possible. Using ice and compression wraps and keeping your foot elevated as much as possible can also help in the short term with pain and swelling. The sports injury experts at Austin Foot and Ankle Specialists are Central Texas’ best when it comes to accurate diagnosis and effective treatment of metatarsal fractures. We can help you avoid long-term injury and get back on your feet fast. To set up an appointment, please call (512) 328-8900 today.